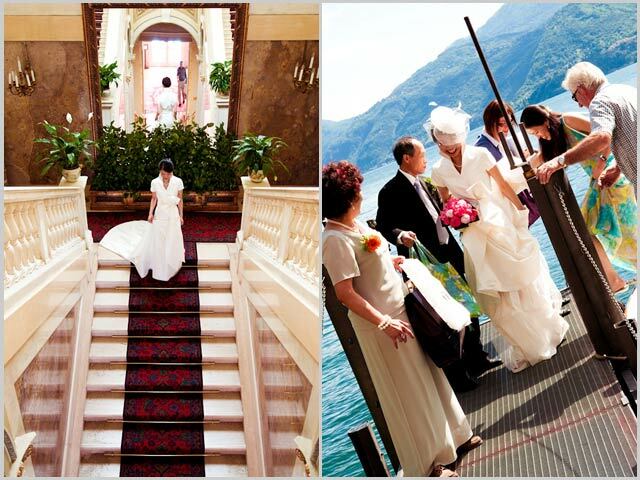 Home » Lake Como Weddings » Varenna Weddings » Varenna: a catholic wedding…asian style! 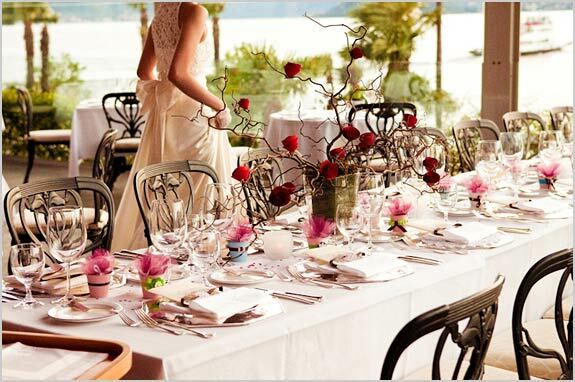 Varenna is very popular on Lake Como for Catholic Weddings. 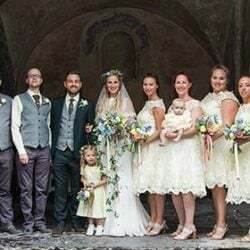 And its fame it’s easily understandable: San Giorgio Church it’s absolutely fascinating and, above all, this is one of the few churches of Lake Como which allow to marry the non – residents. Ancient, charming and impressive at the same time, this masterpiece lies in the heart of the village and represents the focus of the place itself. Varenna it’s reachable by private boat or ferry from most of the other towns of the Lake. 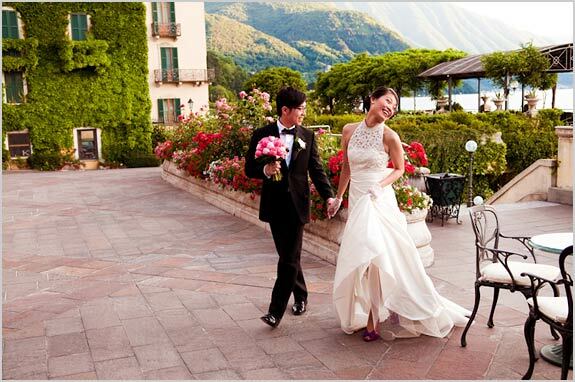 This means that although Varenna is lovely you can decide to spend your wedding holidays not necessary based in Varenna itself. 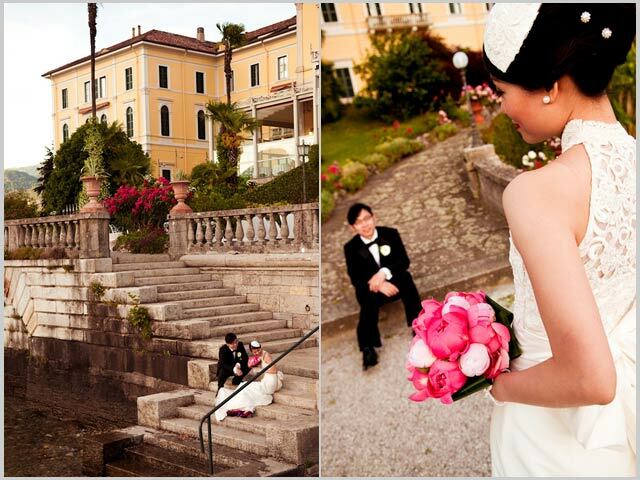 Helen and Steve, our elegant Asian couple for example, chose to stay in Bellagio with their guests at the well renowned Grand Hotel Villa Serbelloni. 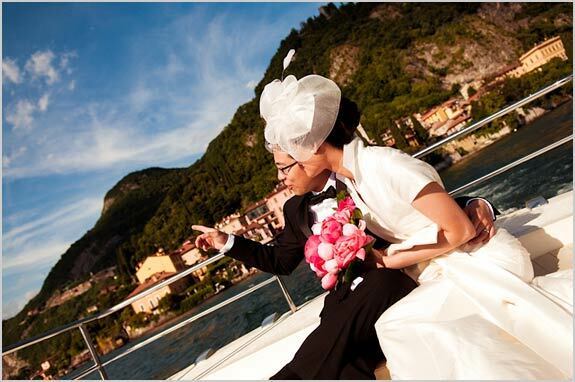 After their ‘getting ready’ and some beautiful shoots, they reached Varenna by boat: a unique occasion to enjoy the lake! 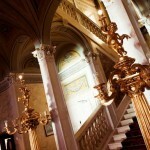 Once arrived in the main Varenna square, a long stair leads you in front of the main entrance. 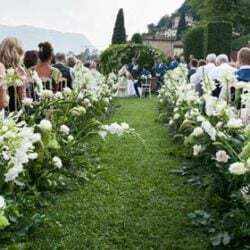 This is a perfect setting for the wedding decorations: white and long aisle, flowers and candles create a special and evocative atmosphere. 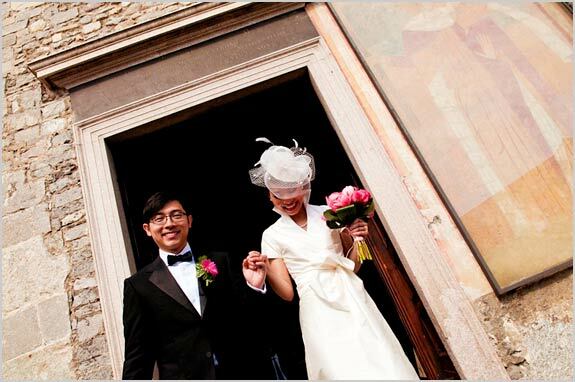 How can you forget the moment when you step inside the church accompanied by the wedding march notes? I think this is one of the most touching and unforgettable moments in our life…. 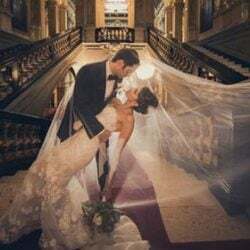 Crossing the aisle, hearing the people you love murmuring excited, somebody’s crying and…finally you reach the altar for your forever promise of respect and love. The sound of the Ave Maria, the exchange of the rings, every moment will remain in your mind for the rest of your life. 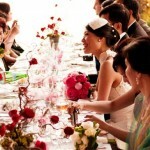 At the end of the ceremony you cannot miss the petals through as good luck from all of your friends and relatives. 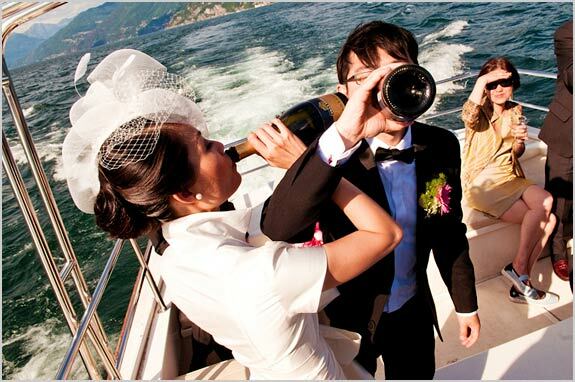 Now that you’re married, the party moment should begin. 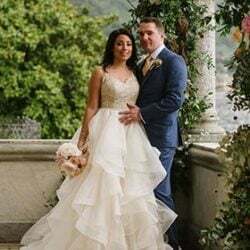 Helen and Steve, decided to go back to Bellagio by private boat and have their wedding reception, welcoming their guests at Villa Serbelloni. 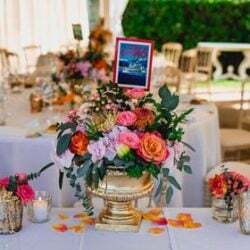 The beautiful and sunny day helped this event having a spectacular result! 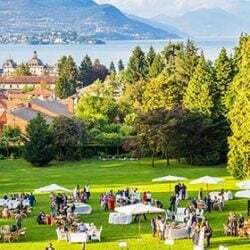 After dropping off the boat, the newlyweds and their friends had a nice walk through Serbelloni accurate gardens to take pictures and relax, just before the delicious meal. 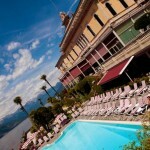 Serbelloni skilled staff prepared a refined long table lake view and served impeccably. 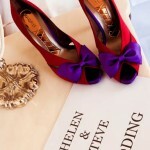 As I use to say, each wedding is something different and unique, and this for sure was: you can just read it in Helen and Steve eyes! All Images © Mauro Pozzer. Mauro Pozzer was born in Vicenza and he’s a Lake Como lover. 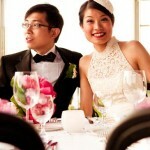 He’s a wedding photographer with a long experience in ceremonial photography. His unique style captures the events and its unique details emphasizing with his shots emotions and expressions of each special event. 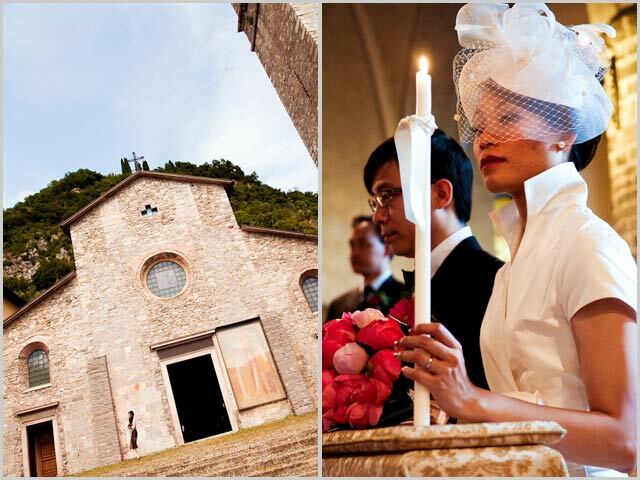 For more information about Catholic Weddings in Varenna – Lake Como – please contact us.